October 1st. And that which was feared came to be. Everything was ready for the high-risk, illegal referendum. 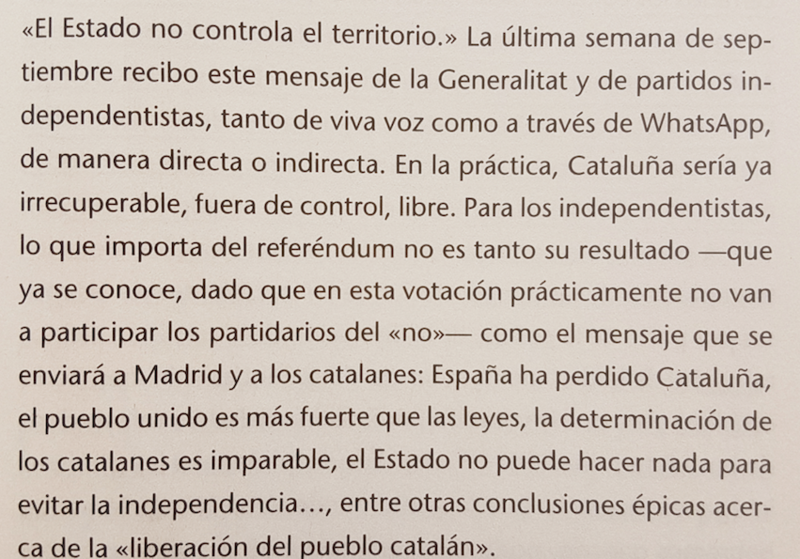 In the preceding days, some people in the secessionist camp tried to convince Puigdemont to desist from holding the referendum. So told me later a PDeCAT MP who feared the voting would unleash violence. On October 1st, a soon as I wake up, I go to the poll station at Fort Pienc. What is going to happen? Everything seems possible. The court order that requires police to seize ballot boxes instructs that the operation shall not upset “social peace”, which leaves ample margin for interpretation. Anyway, it seems evident that the six thousand police members deployed since mid September are not going to continue playing just a passive role, since its obvious that their mere presence has not served as a deterrent. After making sure there is no police presence in the surrounding area, except for two mossos [Catalan regional police -TN] chatting against a wall in front of the school without paying attention to the crowd, I decide to go and visit other polling stations. I had been invited as a guest in the Cadena SER morning radio show A vivir que son dos días. I arrive late at the radio studio, in Casp street, but I had warned the producer in advance that my priority was to cover the vote. In fact, when I get into the studio -where New York Times correspondent Raphael Minder and Deutschlandfunk German radio station correspondent Hans-Günter Kellner were already sitting- and I see the first images of police charges in the screen I turn back and leave. The violence in those images stands in contrast to the calm I had witnessed in Fort Pienc school. I explain to the show producer that under such circumstances, I need to go immediately to the place where news are unfolding. Although I thought there could be a police intervention, I was not expecting such shocking images. One hundred meters away from there, in front of the Sagrat cor de Jesús school, still in the same Casp street, people are queueing to vote, but they complain about computer glitches. Spanish government announces they have deactivated the vote-count system, but the Generalitat is working relentlessly to restore it. I go back to the hotel to start writing. I watch images of the police clashes in TV3 again, in loop. They are hard. I don’t think their relevance stems from the violence they show. Actually, they are common whenever police disperse protesters. They are impactful because, while we have grown accustomed to see young anarchists taking beatings in demonstrations against globalization or austerity, we are not used to seeing older people, mothers, shirt-wearing civil servants or tietes -those archetypical bourgeois women, around sixty, with perfect hairdos, that represent traditional Catalan society- dragged through the ground. Even less so when it’s in the act of protecting some ballot boxes. The effect is demolishing for the image of the state. Nonetheless, the surprise and the rage of secessionist leaders does not match with what they have stated and repeated to me for months. For many of them, it was necessary to push the state all the way to the limit and force it to react, if possible in a disproportionate manner. Rajoy’s silence and indifference was unbearable for them, because it gave them cause neither to push forward nor retreat.